in provinces performs duties described under district engineer (waterworks) q.v. sees that estimates for new and repair work are accurately compiled, that plans and specifications are prepared, that stations and sub-stations are properly and adequately equipped, etc. ; from time to time goes to inspect new or repair work in hand; supervises work of resident engineers at sub-stations; works under instructions from and in close and constant collaboration with chief engineer q.v. ; assists chief engineer generally, and takes his place when he is absent. is responsible to board of directors (or to committee of local authority) for technical side of electricity or waterworks undertaking, including development work and equipment of stations; causes plans, estimates and specifications for new and repair work to be prepared; gives technical advice to resident engineers, mains engineer q.v. and other subordinate officials; in undertakings where chief assistant engineer q.v. is not employed, supervises work of resident engineers. visits new or repair work in progress, and substations; in small undertakings often also acts as general manager q.v. a technical engineer who interviews prospective consumers and points out advantages of electric light or power and advises them as to installation, etc. ; takes measurements and gives estimate of cost; when such work has been carried out, examines work after completion to ensure that it meets customers' requirements; investigates complaints; collaborates with sales department and sometimes in small undertakings takes charge of that department; cf. sales engineer. in charge of distribution department of gas company; is responsible for preparation of plans for laying of mains, opening up of new districts, maintenance of meters, pipes, mains, burners, cookers, street lamps, etc. (London) in charge of water distribution in a district; is responsible to chief engineer q.v. for water mains and plant in his district, also (except at stations where a resident engineer q.v. is in charge) for filtration and pumping; usually a qualified civil engineer; outside London, corresponding officer is more usually called assistant engineer q.v. see chief engineer; (in waterworks) also visits pumping stations, reservoirs and filter beds from time to time. a technical engineer responsible for efficient working of gasworks and for upkeep of plant therein; approves plans and estimates for new and repair work; orders repairs to be executed where necessary; sometimes responsible for payment of wages to manual workers; in small works often combines duties with those of general manager q.v. a technical engineer responsible to chief engineer q.v. or chief assistant engineer q.v. for whole network of mains from power station to consumers' premises; issues orders for minor repairs on his own responsibility, or, where expenditure is likely to be considerable, submits estimates to chief or chief assistant engineer; supervises execution of all repairs; also supervises new work according to plans and specifications supplied by chief engineer. surveys mains and is responsible for records and charts of entire distributing system between power station and consumers; prepares plans for extension of mains. 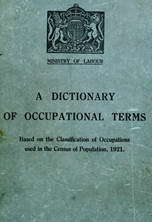 has general administrative (and sometimes also technical) control of the whole undertaking for supply of gas, water, or electricity, subject to approval of board of directors, or of committee of local authority, in matters of policy, or where a large expenditure is involved; submits reports to directors or committee regarding new works or extensions, improvement of plant, increase or reduction of staff, staff promotions alterations in scale of charges; in smaller undertakings, where term is chiefly used, is often also chief engineer q.v. and sometimes also secretary (930) q.v. responsible for efficient organisation and working of meter department; supervises allocation of work and issues orders to meter fitters (309) q v.; ensures that work is promptly and efficiently performed; acts in cooperation with sales department and with consumer's engineer q.v. a technical engineer who either resides at a station or sub-station or is promptly available when required, in order that uninterrupted supply of electricity may be maintained at all times; rectifies small faults in running of generators and plant, or instructs repair gang to effect repairs; meanwhile orders, if necessary, isolation of generator and starting of another to maintain supply; where considerable expense is involved, reports to chief or chief assistant engineer q.v. before undertaking extensive repairs. resides at waterworks and is in charge of all staff employed thereat; responsible to chief engineer q.v. or to assistant or district engineer q.v. for general maintenance of his station, for pumping, filtration and storage of water and for minor repairs to plant; at larger stations, where pumping and other machinery is installed, is usually a technical engineer; at smaller stations, particularly those where there are only filter beds, his position approximates to that of foreman (692) q.v. takes place of resident engineer q.v. during night shift, or when resident engineer is absent; duties are generally similar to those of resident engineer q.v., except that extensive repairs would not be undertaken without sanction of resident engineer. a technical engineer in charge of sales department; may also be in charge of a demonstration station, which may or may not carry out contracts for installation, etc. ; interviews customers and gives advice as to use of electrical appliances and recommends type most suitable for customers' requirements; may also be consumer's engineer q.v. see resident engineer (electricity supply). as for resident engineer, assistant (electricity supply).